As we all wait for season two of Netflix’s fantastic ‘80s-era sci-fi drama, Stranger Things, we can kill the time by speculating on the mysteries presented in the show. What, exactly, is the Upside Down? What’s the deal with that faceless monster—how does it see? What happened to Eleven? I’m happy to say that I think I’ve found a solution to the absolutely least important question: why are the kids’ bike headlights orange? 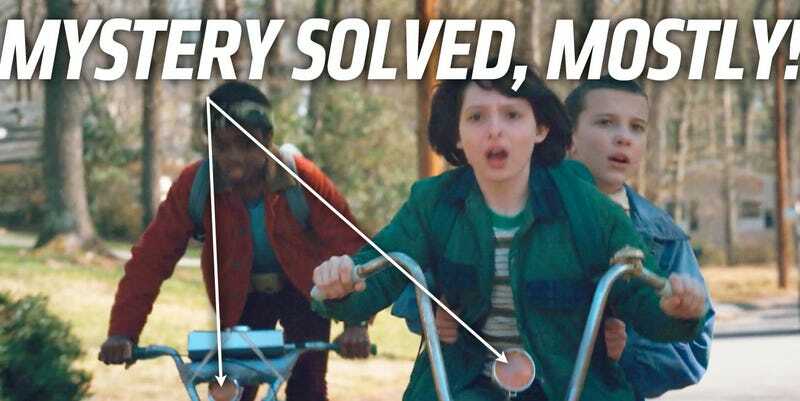 I’ve previously investigated the car-casting choices made by the people behind Stranger Things; generally, they did a very good job, with just a few fairly minor anachronistic mistakes, most of which nobody beyond the painful obsessives like myself site would notice. Aside from the cars, there was one strange transportation-related mystery on the show: the orange headlights on the kids’ bikes. Now, sure, some readers have said the bikes themselves aren’t period-accurate, but I think at least one is an actual ‘80s Schwinn Stingray. I’m not certain about the bikes themselves, but the one thing I do know is that bike headlights were not orange in the 1980s. I grew up in the ‘80s: I was there. I’m a veteran of both the Cola Wars and the Cold War. I, along with my little feathered-hair ‘80s kid pals, had crappy cheapo bike headlights that ran off a little wheel-driven generator. So, why are the ones on Stranger Things orange in the daytime? At night, they emit the usual yellow-white light that you’d expect—though, they do stay on when the bike isn’t being pedaled, which show’s they’re battery-powered fakes, but that I can forgive. The orange, not so much. The orange is a gel (really a plastic colored sheet that allows light to pass) for production. It changes the color temperature of the headlight to match the color temperature of the professional lights used by production. And/or to dim the lights. Most likely during the night shots where they were riding through the woods, and on the street. You can also see the gel on Lucas’s bike starting to peel back at the top, and grey gaffers tape holding it down at 3 and 9 o’clock on the headlight. This is just an educated guess. I’m not sure why they didn’t remove it for the daylight shot. I don’t work on these large network productions, but I work production on local news, public affairs and documentary style features. So, I think this is a decent guess. That just leaves the real mystery: why didn’t they remove the gels for the daylight shots? For as much attention as every other detail in the series got, this seems a strangely obvious thing to overlook. Then again, in reading this over I’m a little stunned and uneasy that I’m devoting this much time and attention to such a tiny detail. Is there something wrong with me? I’m sure this will all get explained in season two. It’s probably one of the biggest priorities of the writers, I’d bet.